Update (25 April 2013): Tower Poker has closed down. TowerGaming has been purchased by CakePoker (WinCake) and Jetbull Sportsbook (yeah I know, apparently gambling is synonymous with bulls and jets). All Tower Poker players have been migrated to CakePoker. This ends the seven-year operation at TowerGaming.com. I'll leave this old review up for a laugh. Just in case you find this page in a few years time and want to get all nostalgic over the old screenshots and those long-gone juicy bonuses. Tower Poker is my favourite room on the OnGame network. The high player volume, valueback deal and short-handed tables make it the perfect room for regular players who enjoy short handed action. However, you do have to put up with "clunky" software. If you can get used to the software, Tower Poker would be my top recommendation for short-handed enthusiasts, or anyone simply looking for a solid room with good player volume for that matter. Solid valueback deal of up to 40%. Yes, valueback. It's very much like rakeback on a sliding scale; check out the what is valueback? article for more information. All in all, the money you save with this valueback deal at Tower Poker means that it will add that little extra to your bankroll at the end of the month. The other positives with Tower Poker are that it sits in the #5 spot in terms of traffic (so plenty of players), and it is the top room for short-handed players. The room has an abundance of 3, 4 and 5 seater tables, which for some reason are absent at most rooms. Tower Poker competition and traffic. Tower Poker (and the OnGame network in general) are comfortably in the high end of the top tier poker rooms when it comes to player traffic. The NL Hold'em stakes right from $2NL up to $1,000NL are always busy throughout the day, so there are no problems with the traffic at Tower. I have played at Tower Poker pretty extensively over the years, and from my wealth of experience I have found all of the stakes to be easily beatable as long as you have a decent strategy. However, for some reason $50NL is amazingly tight at OnGame skins, which makes it a very frustrating level to play. I would recommend you avoid that level if possible and jump right from $25NL to $100NL as soon as you are properly rolled. 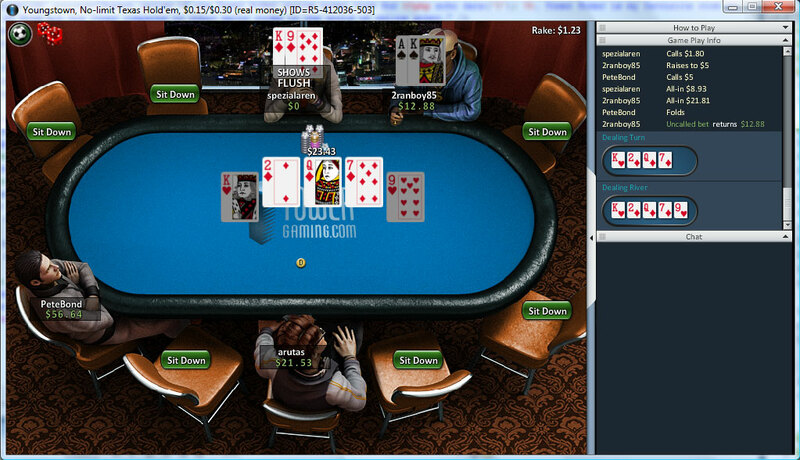 The Tower Poker software went through a big update in mid-2009, which helped to improve the playing experience. The client improved, but there is still room for improvement. The worst part of the poker client from Tower Poker is the smallest tables after resizing are too cluttered, which makes it difficult to keep up with the action. If you have a bigger screen (1440x900 or greater) it should not cause any problems, but if you have a small screen then multi-tabling may be a little tricky. Bonus is very easy to clear. 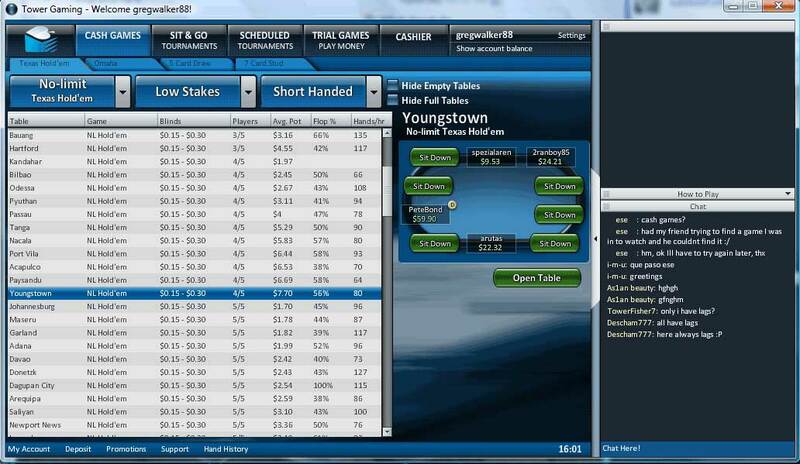 Bonus + valueback makes Tower Poker very profitable for new players. If you go to the bonus section of the Tower Poker website, you will see that they offer a variety of different bonuses for you to choose from (they refer to this as the "Tower Of Bonus"). These bonuses are very easy to clear, which makes Tower a very profitable room to play at (even if you don't intend on staying there after the bonus). The important information for each of the bonuses is outlined below. 240 points needed to redeem bonus. Bonus paid in $5 installments. Bonus paid in $10 installments. Bonus paid in $115 installments. 15 days to clear bonus. Bonus paid in $350 installments. Which Tower Poker bonus should you choose? All of the Tower Poker bonuses clear at the same rate of 8 player points per bonus dollar, which is an exceptionally good rate. Therefore, the important information to look at is the time frame you have to clear each bonus and the size of the bonus payment installments. The bigger the bonus, the less time you have to clear it and the bigger the installments will be, so choose the bonus that you think you can comfortably clear based on how often you play. Go for the $200 bonus if you are a lower stakes player. This is the largest bonus you can get with the maximum 60 day time limit to redeem your bonus money. $5 installments are nice too. Go for the $500 bonus if you are a regular mid stakes player. This has a shorter 30 day limit for redeeming the bonus, but the $10 installments are much friendlier than the $1,000 bonus ($115 installments). Just be careful to not fall in to the trap of choosing the biggest possible bonus. Don't forget about those redeem requirements! Tower Poker bonus details (biggest).